HP Network Team #1: PROBLEM: A non-Primary Network Link is not receiving. Receive-path validation has been enabled for this Team by selecting the Enable receive-path validation Heartbeat Setting. ACTION: Please check your cabling to the link partner. Check the switch port status, including verifying that the switch port is not configured as a Switch-assist Channel. Generate Broadcast traffic on the network to test whether these are being received. Also make sure all teamed NICs are on the same broadcast domain. Run diagnostics to test card. Drop the NIC from the team, determine whether it is receiving broadcast traffic in that configuration. There are many causes, this can be caused by Cisco switches (and HP Procurve switches), not liking the firmware, NIC driver, or HP Teaming software. 1. Update the firmware on the network cards. 2. Update the Drivers for the network cards. 3. Update the HP Teaming software. 1. 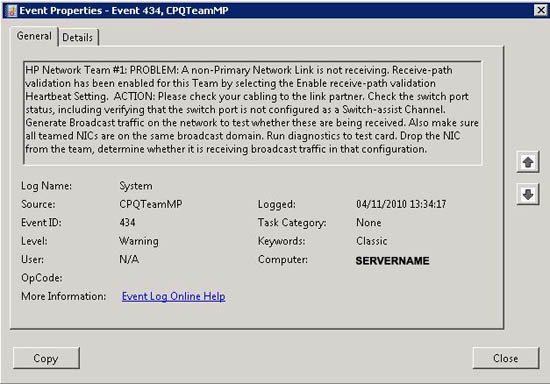 Open the properties of the network team (double click the teaming icon in the task tray). 2. Settings tab > un-tick “Enable receive path validation” > OK.